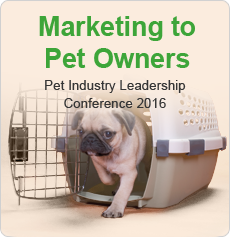 What Trends are Marketers Using to Attract Today's Pet Owners? "Marketing to Today’s Pet Owners," will help you find out which trends marketers can take advantage of to attract consumers to their pet products and services. Fill out the form to gain valuable information on consumer demand for which trends influence marketing tactics .